I am continually amazed by children, especially the way they perceive the world. I envy them, for the most part, and often find myself emulating them. To disregard the admonition of the adult in me, often makes life fun. One evening after dinner, we got on an elevator in a hotel in Jerusalem. Another couple from our tour group was with us and we were all staying on the 16th floor. Someone pressed the button and the elevator doors closed, then opened again. Another couple got on with us. The man was wearing a yarmulke and carrying a toddler. When I greeted them with, “Good evening,” the man smiled. I assumed his reticence to reply meant he didn’t speak English. The door closed and opened a couple more times. We looked out to see if someone was pressing buttons. The door closed on someone’s shoulder and started a loud buzzing alarm. “Errrrrrrr!” We pressed some more buttons but the elevator would not go and the buzzer wouldn’t shut up. I found this quite humorous. Speculating maybe this particular conveyance was set up on Shabat mode, we were chattering about it in English; the Israeli couple was muttering in Hebrew; the beautiful child was looking round-eyed. I started laughing. We all got off the elevator and tried another. It did the same thing. I found this hysterically funny, thinking the young Israeli couple probably thought we broke the elevator, most suspicious specifically because I was in a fit of giggles. On the second floor, we discovered all the elevator buttons pointed down. Of course I thought this quite funny. “We could ride one down,” I sputtered between gasps for air. “Maybe then it would go up.” What else could we do? We piled in. The doors closed and the elevator went down to the lobby floor. The doors opened and there stood our Israeli couple. I laughed so hard my eyes teared and I just about fell over. The young woman backed away, scowling fiercely. She surely thought I was drunk. We rode down to the spa in the basement. The doors opened but no one was there. This is funny, too, no? Then the elevator started going back up. We stopped at the lobby and picked up our Hebrew friends, noting the other elevator standing open and buzzing loudly. From there, our conveyance worked properly, whizzing along until we got to the young couple’s floor. 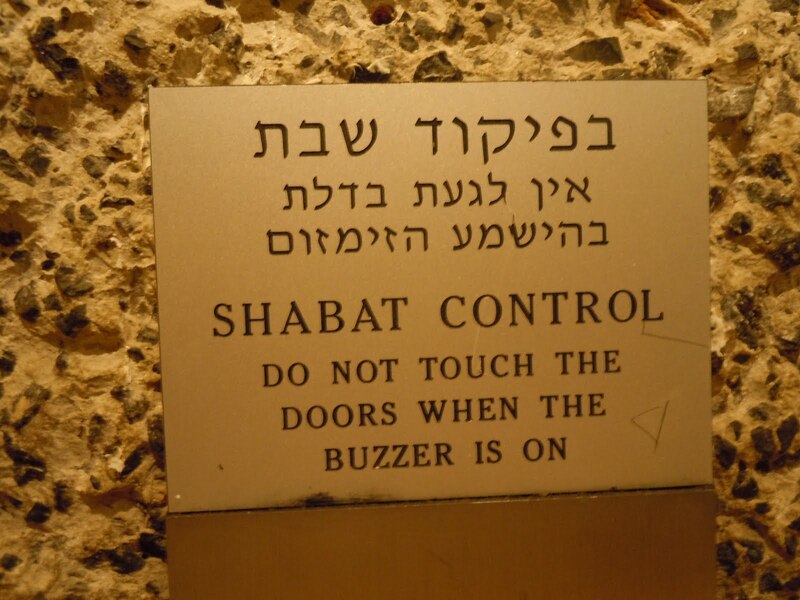 “Shabbat shalom!” I told them. The young man rewarded me with a big grin and a wave, in spite of his disgruntled wife’s disapproval. I fell into bed that night still laughing about our crazy elevator ride. I’m laughing about it three weeks later. The only unhappy part is the woman’s attitude. How sad that one of the most memorable parts of our trip to Israel made that poor woman so cranky. I do hope her child takes a clue from Daddy. This entry was posted in Short Takes on Life and tagged attitude, elevator malfunction, fit of giggles, Hebrew, Israel, memorable mishap. Bookmark the permalink. Janet, I laughed when you told me this story in person, and am laughing all the more reading it now. How funny! And yes, how sad for the cranky woman:(( She, of all people, certainly NEEDED to laugh! We can hope she laughed about it LATER. We all have times like that, when we take life too seriously. Sometimes we simply can’t help it. I would have been rolling on the floor too. Sad more don’t see the humor in life. Wish you could have told her in her native tongue that laughter helps the medicine go down. Ah, perhaps telling her would have eased the tension. Or apologizing for my rude fit of giggles. Sometimes, though, these experiences are what helps us learn how to cope with difficulties. Maybe she’ll laugh next time. Although the Bible is very serious, I suppose modern-day Israel proves that God has a sense of humor! It must be no coincidence that the greatest comedians have always been Jewish (in my opinion – but then again, being Jewish, I am biased). I’ve been living in Israel for over 25 years now. Earning a living, raising a family, coping with the culture/mentality, figuring out what and how to cook – or shop for that matter, learning the language, even trying to deal with the monstrous WEEDS in the spring after a wonderful winter of rain, has all been quite a learning and growing experience. There is nothing like Israel to stretch you, compress you, and show you who you really are! Janet, I hope you will come back again to visit! If nothing else, you will get more great material for your blog! Wonderful to have the input and perspective of an Israeli. 🙂 Thanks for your comments! This story made me smile, thanks for sharing! Yay! I’ve accomplished something. Thanks for the input.